First, may I say that I love WordPress? I’ve been on the site for over two years, but it’s only in my recent come-back to the blog that I’ve begun forming bonds with other people. I realized I just love talking to people about video games, so why not seek more people out? Since then, I’ve been checking out the list of people who have recently published articles about games. In doing this, I have met wonderful people and have gotten almost double the amount of followers (which is still small, but an amazing assortment of people). It’s the bonds with people who keep me here on WordPress and chatting. I also have met indie developers, who use WordPress to chronicle their journey with their game or their career. However, I’ve met one guy who’s taken this a little further. Peter Carrell is an indie developer who is doing just that: using WordPress to track and chronicle the development of his work in progress by working title of Gentle Night. Gentle Night is a short narrative-driven exploration game featuring simplistic character designs to match the eerie and dark atmosphere. Players will take the role of a tall imposing character and meet NPCs such as the Old Man, who will give the player quests. 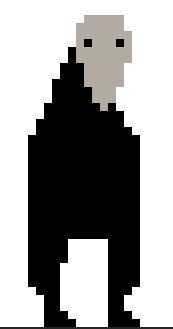 Standing in your way right now is a mysterious large and foreboding character, who I hope to learn more about as the game develops. But the reason Peter Carrell stands out in a large ocean of independent indie developers is because of his willing attitude to take in other’s opinions and implement them into his game. It speaks a lot of his personality that Carrell is not only willing to initially listen to me, a complete stranger who jumped into his blog spouting random opinions, but willing to actually consider the ideas and opinions and sometimes put them into the game. Almost every day Carrell would post his progress for the day and what he implemented in the game. One day, I mentioned the dark atmosphere would benefit from rain. Seemingly inspired, Carrell immediately put it into development. 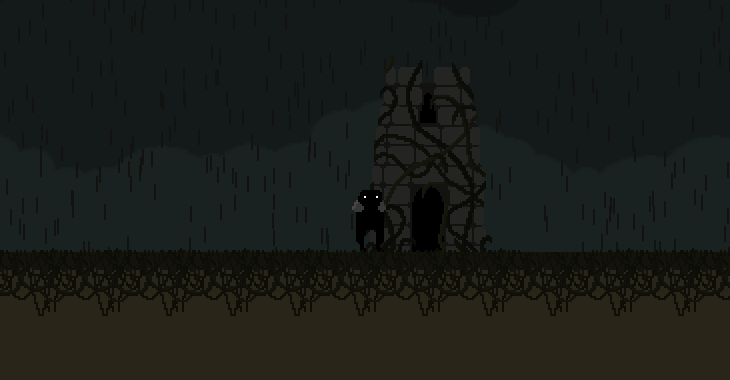 The next day, a prototype of rain was implemented, as well as a post about the complications and process of adding it in. For someone like me, with no programming insight, these post are fascinating and informative. Seeing a small idea of mine help transform the game was really cool, but it also raised a few questions I had to ask myself. The rain before he improved it. I want to review Carrell’s game when it’s released. That’s partly why I decided to follow him, and other indie developers. I love seeing the process, but reviewing the game is what I will be doing for the rest of my life. I want to get paid for my opinions. But if my opinions and advice is being taken into account so early in the development of the game, how can I review it without bias? Should I not review it altogether? In any case, Gentle Night has been coming along nicely, and I’m excited to see the finished piece. Be sure to check out his youtube channel for his devlogs, and follow his blog as the game continues to evolve and grow. Carrell is an amazingly nice and open guy that deserves many more followers and support. This entry was posted in Uncategorized, Video Games and tagged games, Gentle Night, Indie Developers, Indie Games, Peter Carrell, Video Games. Bookmark the permalink. Great read! Very well written. Wow thats pretty awesome. And sounds like a good game. I’ll have to stay posted on that. Oh and btw. I think you can still do a good unbiased review as long as you disclose your input. Thanks for the advice! Yeah, disclosing any involvement should be the way to go. And definitely check out his blog. He’s a really cool and talented guy that should get more exposure and support. This game reminds me a bit of Limbo in the way it looks. I’m curious to play it myself, now. Well definitely keep an eye on it. I think one of the striking things about it right now is the way the player character walks. You can kinda see it in the gif, a kinda floaty creepy walk.